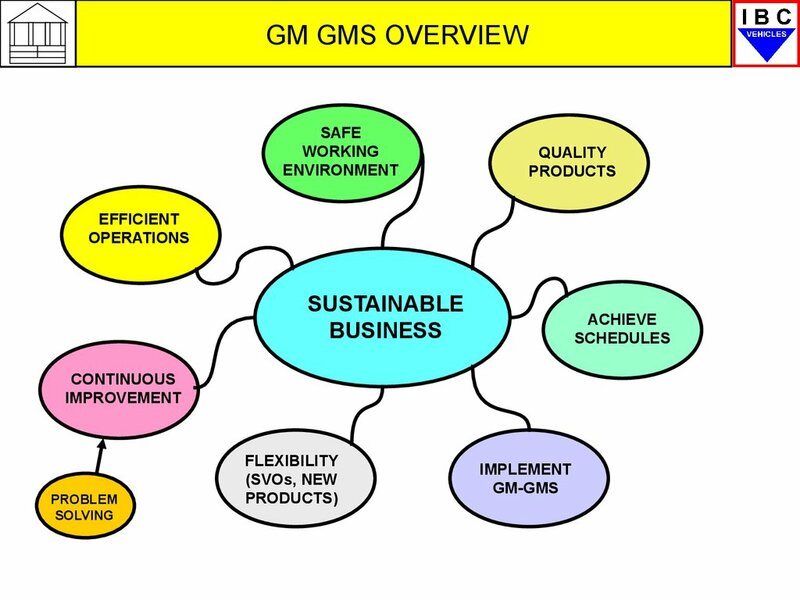 Overview software development methodology Аgile.Вusiness approach. any further, more detailed investigations. 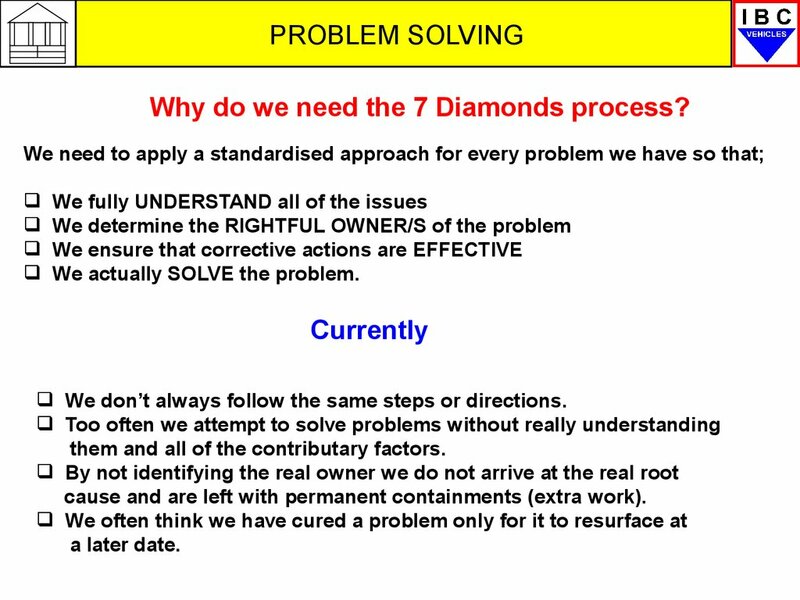 Why do we need the 7 Diamonds process? 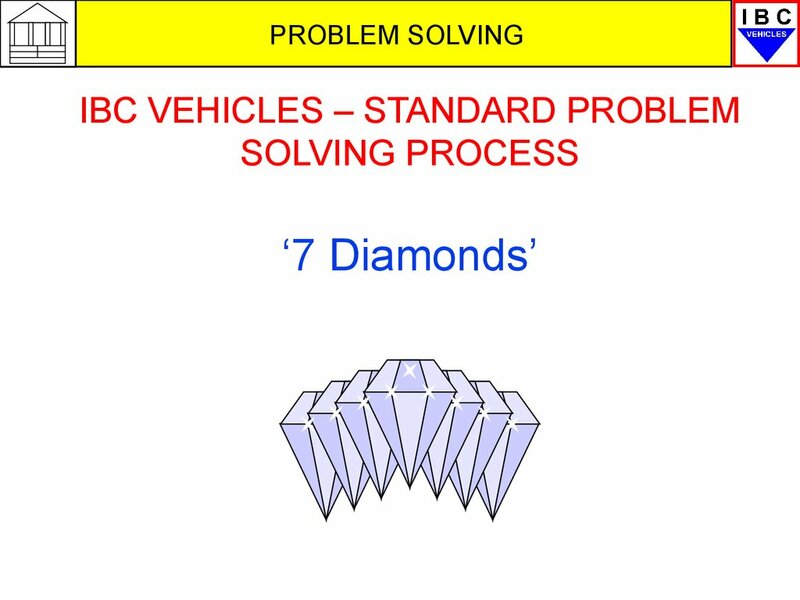 We actually SOLVE the problem. We don’t always follow the same steps or directions. them and all of the contributary factors. cause and are left with permanent containments (extra work). 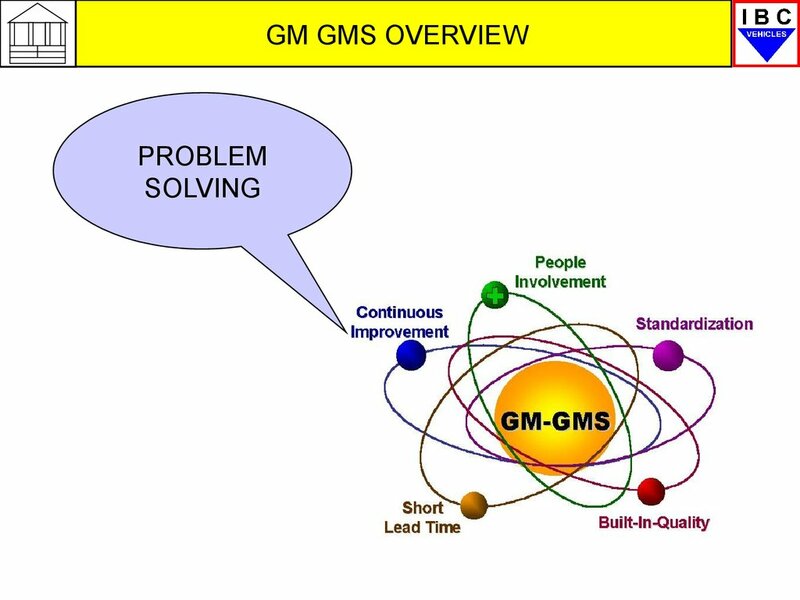 is the standardised work process being used? 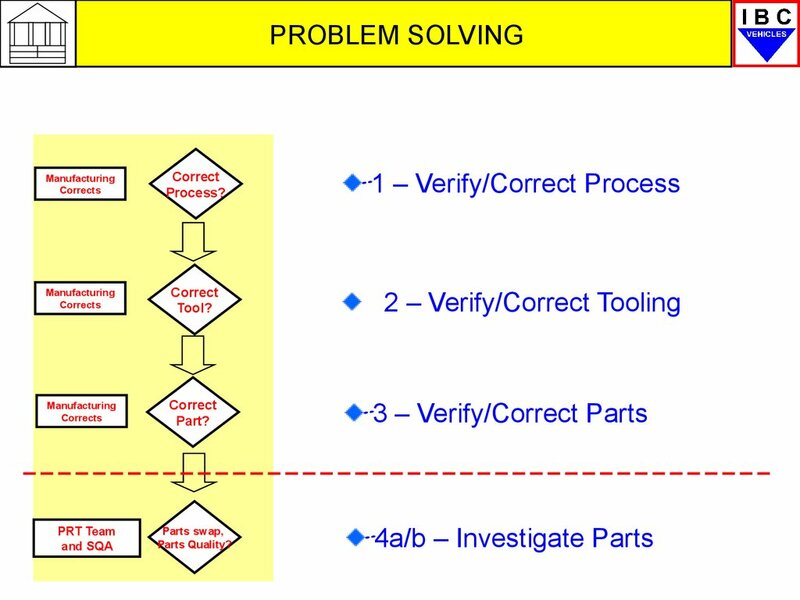 is the tooling standardised and correctly applied? are the right parts being used? Is the process running out of control? 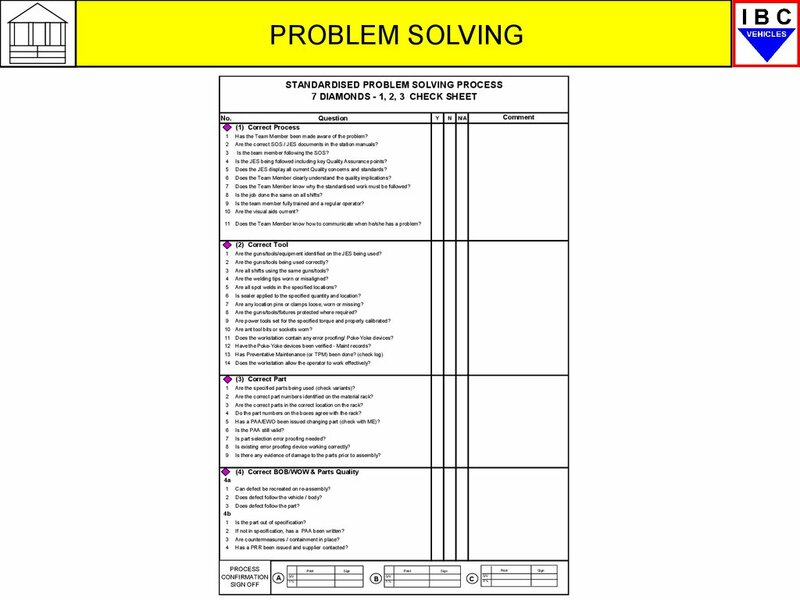 Can the process be changed to prevent the problem/defect? does meet design intent and the problem still exists. must be to immediately step through diamonds 1-3. 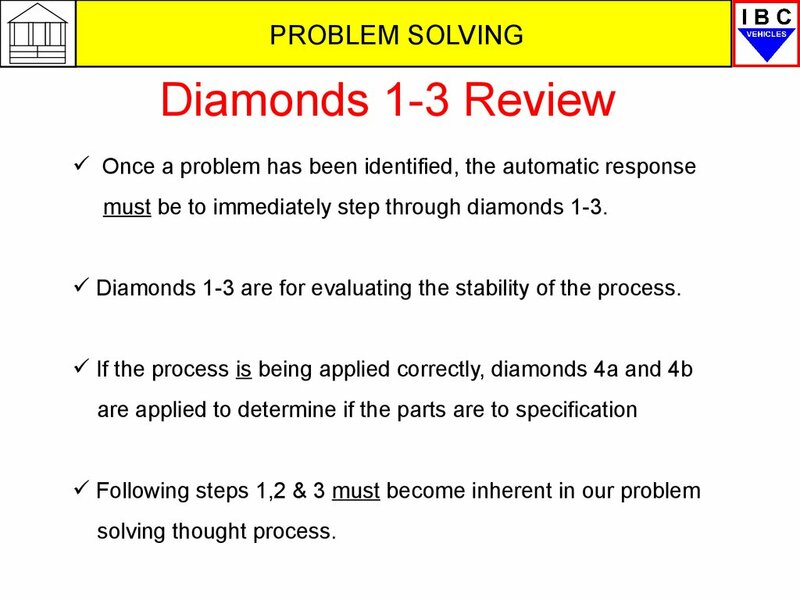 Diamonds 1-3 are for evaluating the stability of the process. 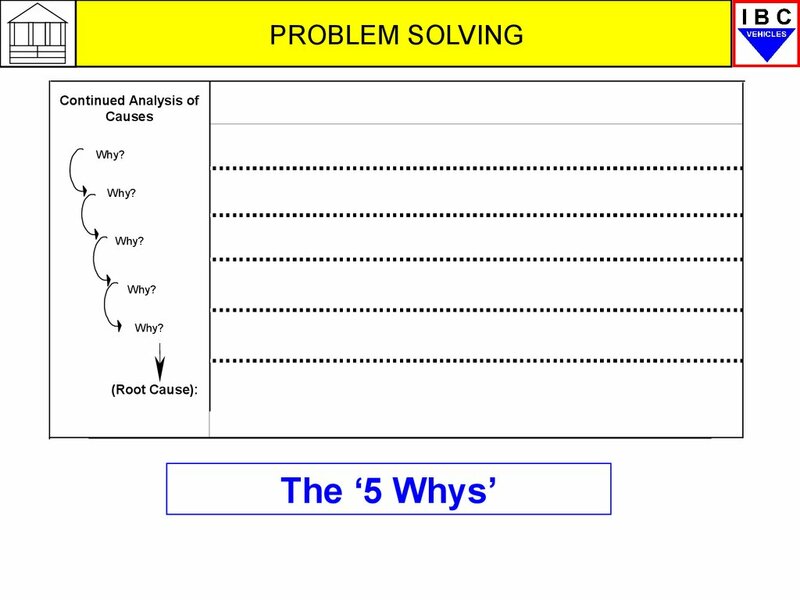 understanding and resolving these problems. 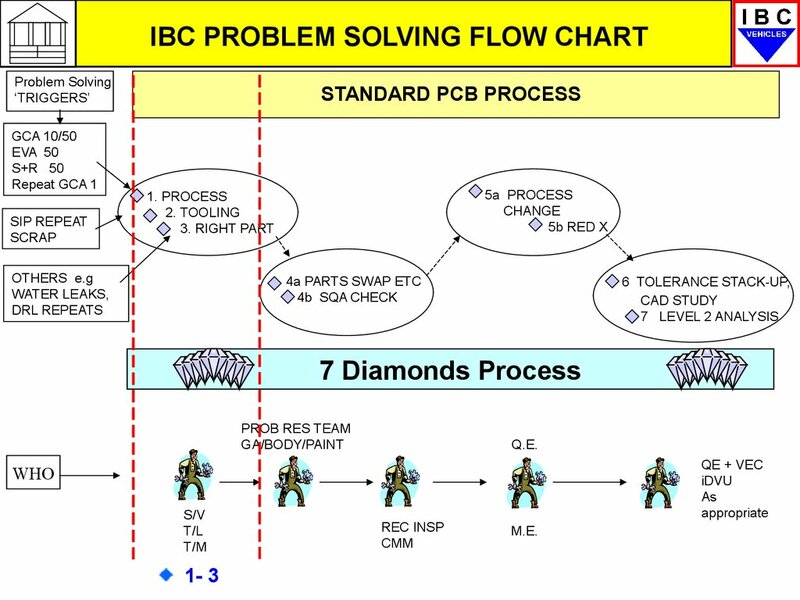 As you will see the PCB is aligned to the 7 Diamonds process. 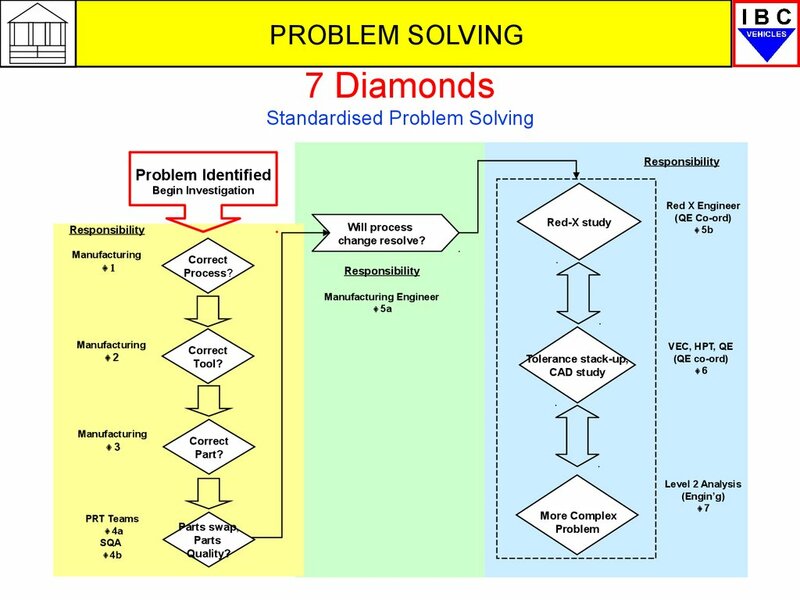 the first 3 Diamonds are those you will be involved in. issued and completed. 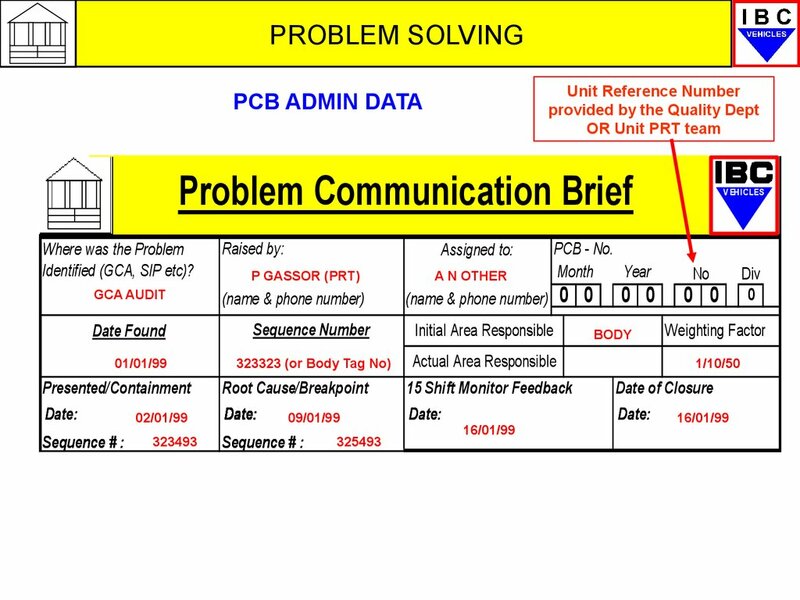 These largely determine who and what generates a PCB. 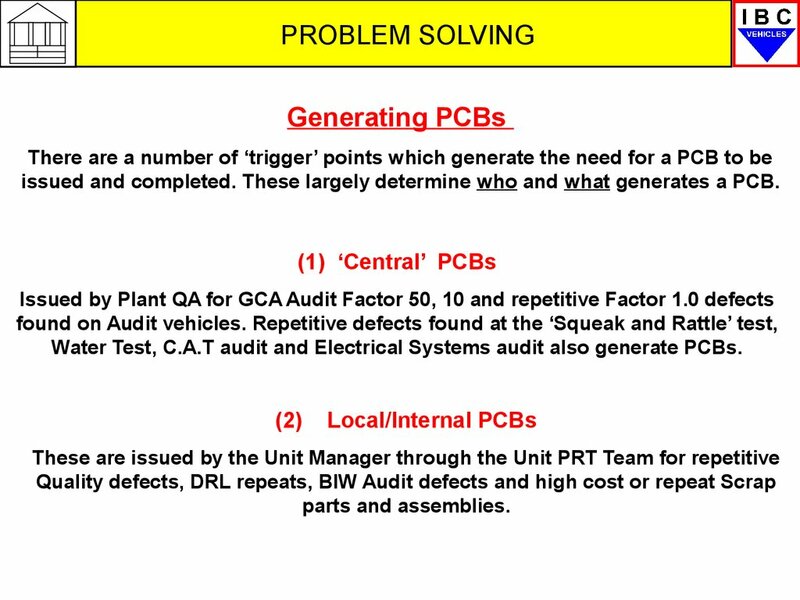 Water Test, C.A.T audit and Electrical Systems audit also generate PCBs. person/s to complete the PCB. 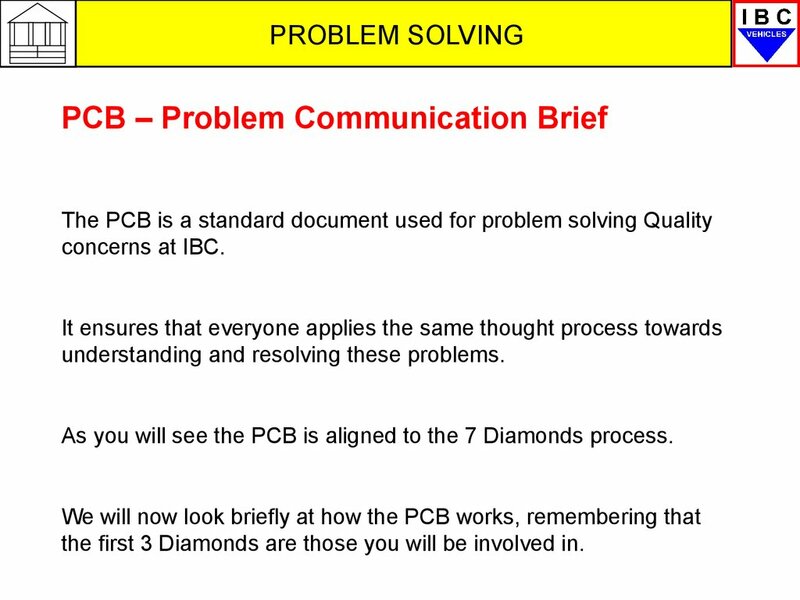 elsewhere or progress the PCB to Diamonds 4a and/or 4b. 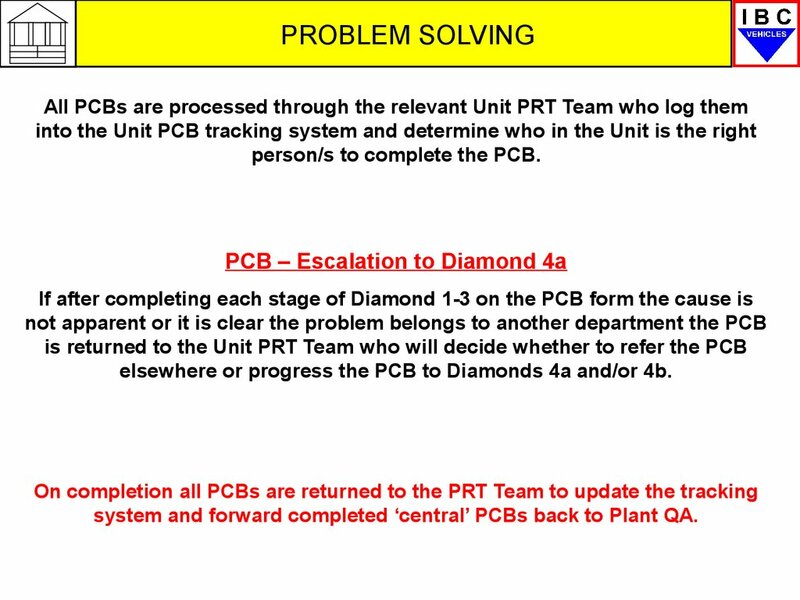 system and forward completed ‘central’ PCBs back to Plant QA. with their Team members on a regular basis. 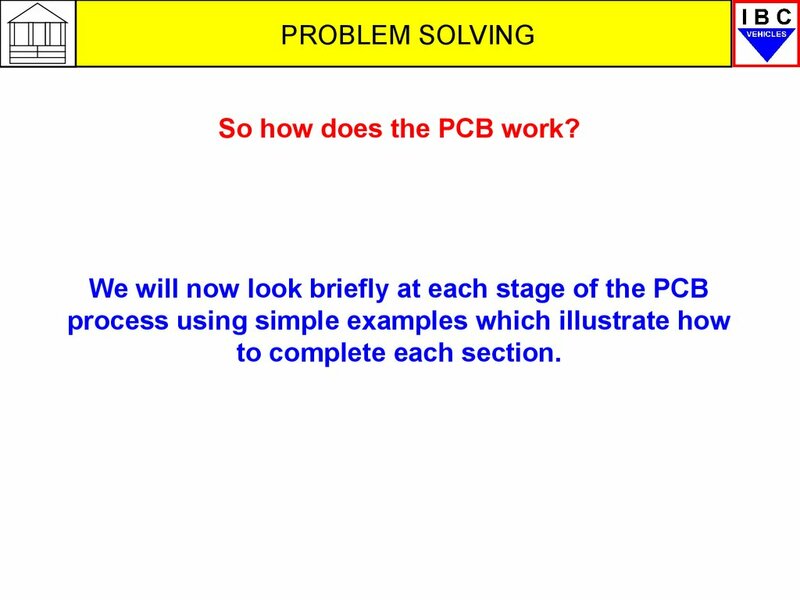 So how does the PCB work? 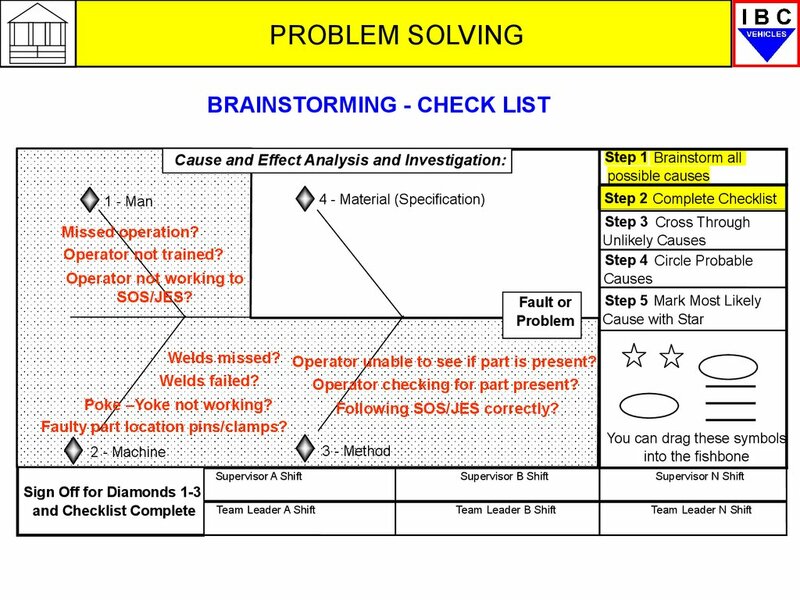 involved in the Problem Solving process. Leader and some or all of the team members. 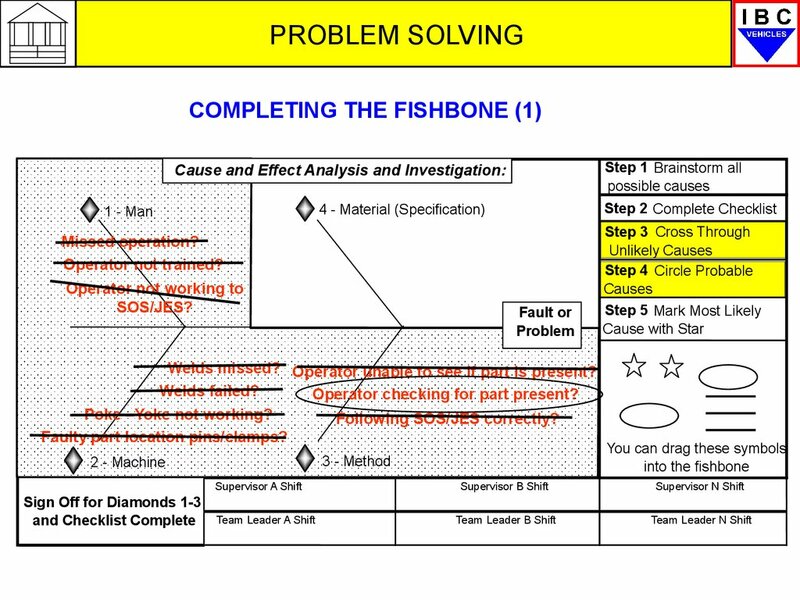 Ensure all group members are aware of the nature of the problem/defect e.g. missing part, damage, wrong part etc. (however likely or unlikely they may seem). As a group discuss each idea and agree on the most likely causes. off and refrain from any further positive input. 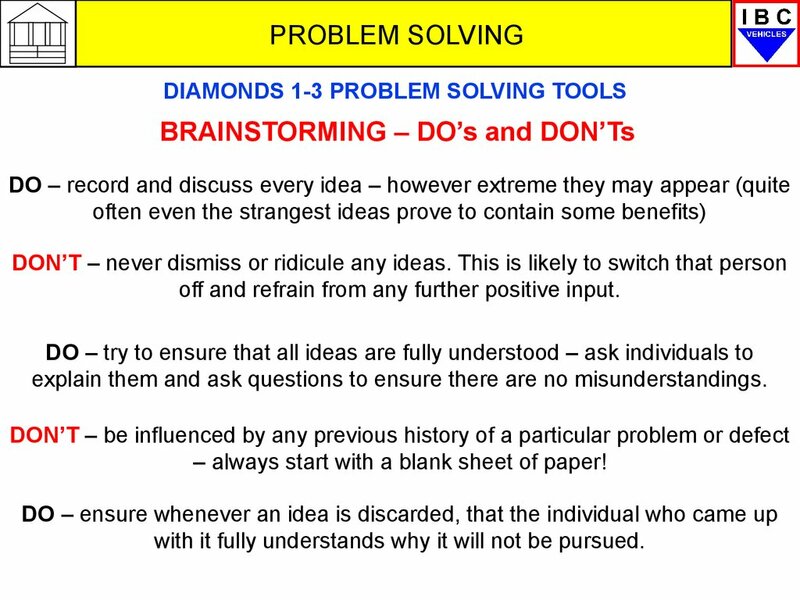 explain them and ask questions to ensure there are no misunderstandings. 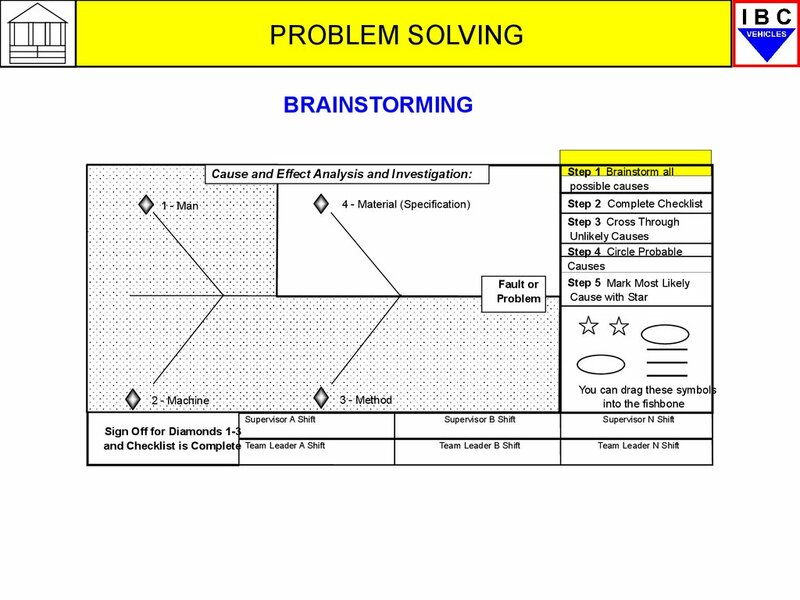 – always start with a blank sheet of paper! with it fully understands why it will not be pursued. Welds missed? Operator unable to see if part is present? Operator checking for part present? 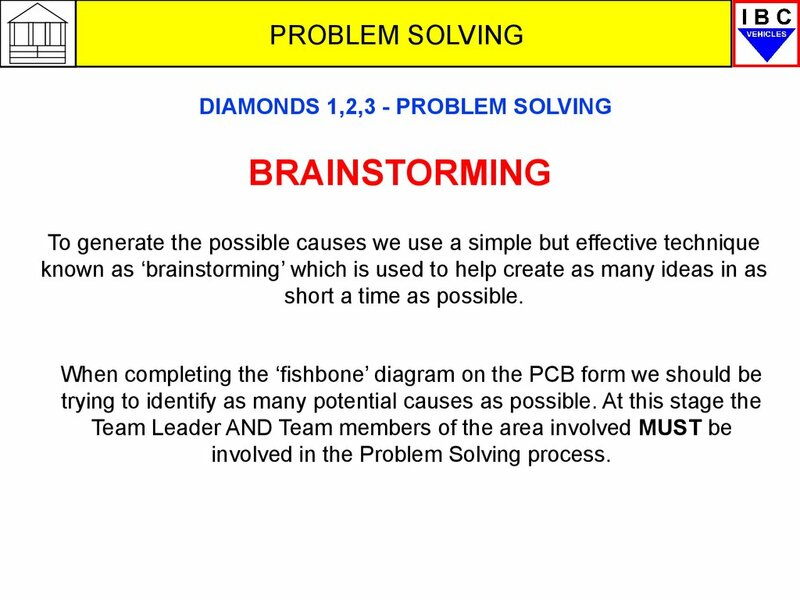 Has the Team Member been made aware of the problem? Are the correct SOS / JES documents in the station manuals? Is the team member following the SOS? Is the JES being followed including key Quality Assurance points? Does the JES display all current Quality concerns and standards? 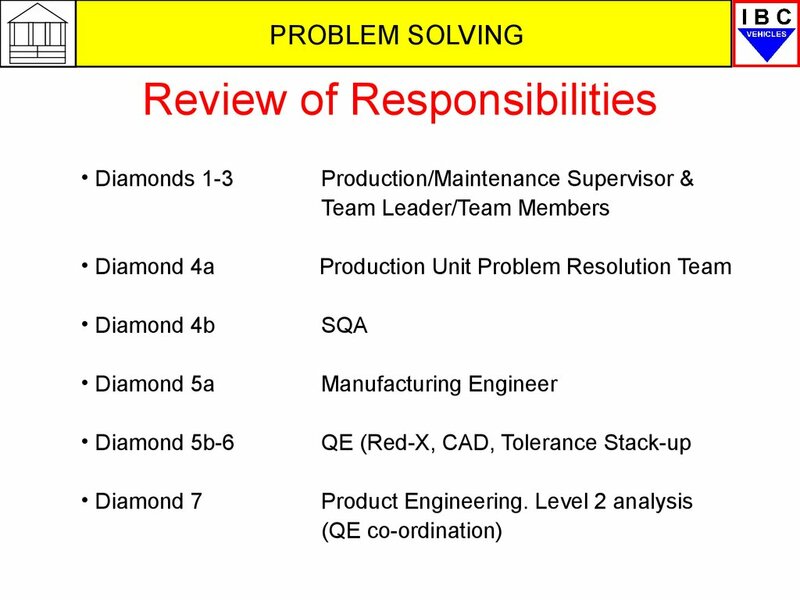 Does the Team Member clearly understand the quality implications? 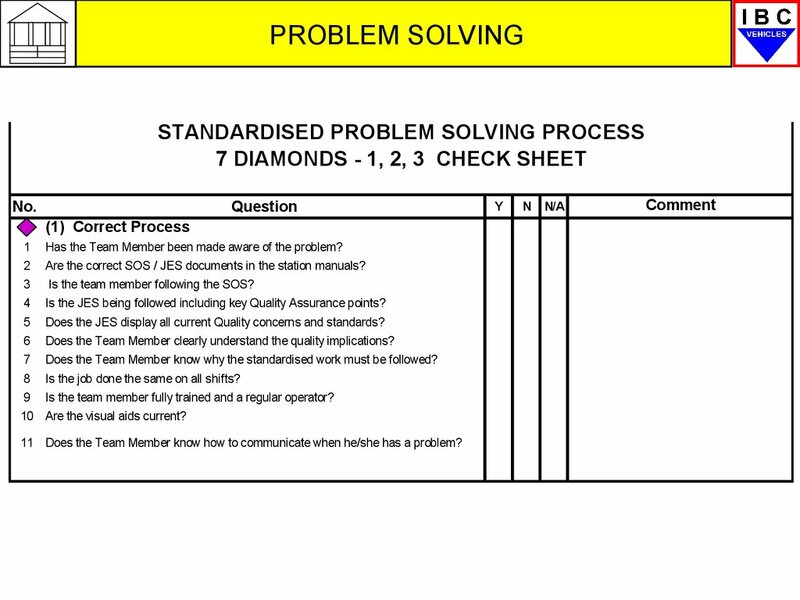 Does the Team Member know why the standardised work must be followed? Is the job done the same on all shifts? Is the team member fully trained and a regular operator? 10 Are the visual aids current? 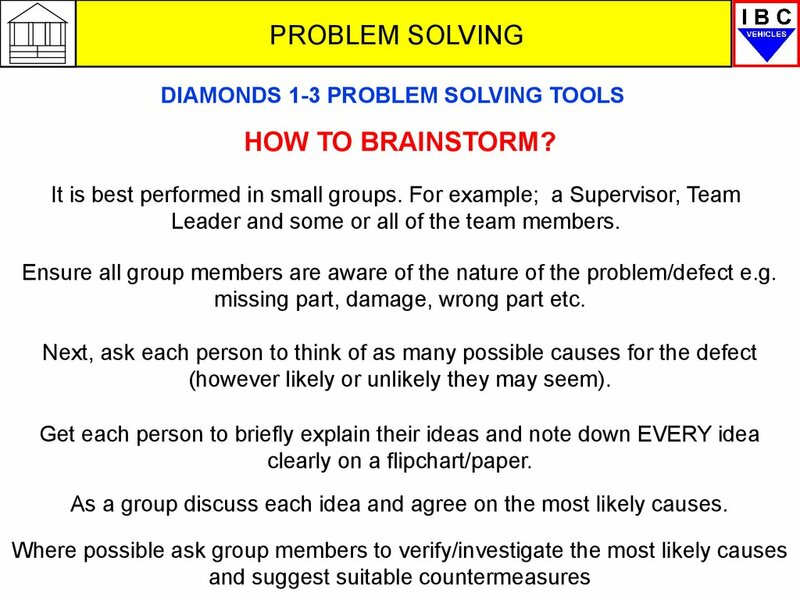 11 Does the Team Member know how to communicate when he/she has a problem? Are the guns/tools/equipment identified on the JES being used? Are the guns/tools being used correctly? Are all shifts using the same guns/tools? Are the welding tips worn or misaligned? 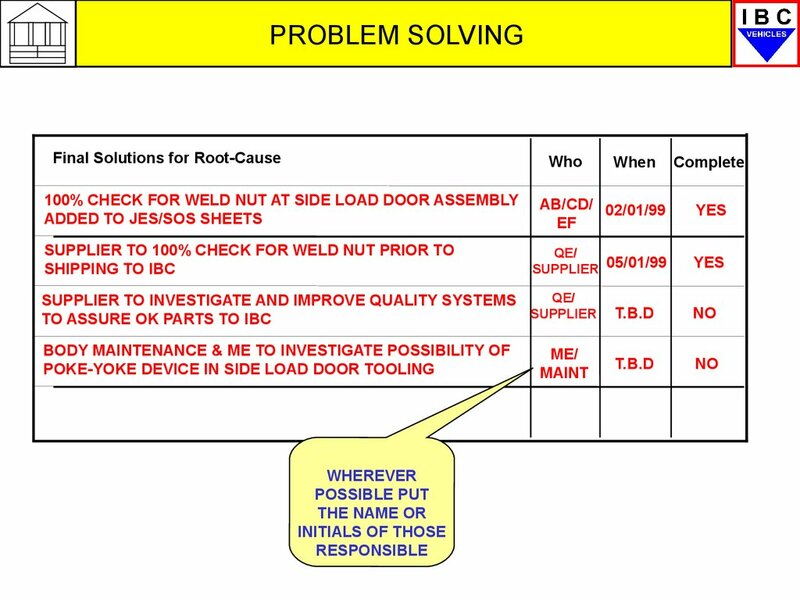 Are all spot welds in the specified locations? Is sealer applied to the specified quantity and location? Are any location pins or clamps loose, worn or missing? Are the guns/tools/fixtures protected where required? Are power tools set for the specified torque and properly calibrated? 10 Are ant tool bits or sockets worn? 11 Does the workstation contain any error proofing/ Poke-Yoke devices? 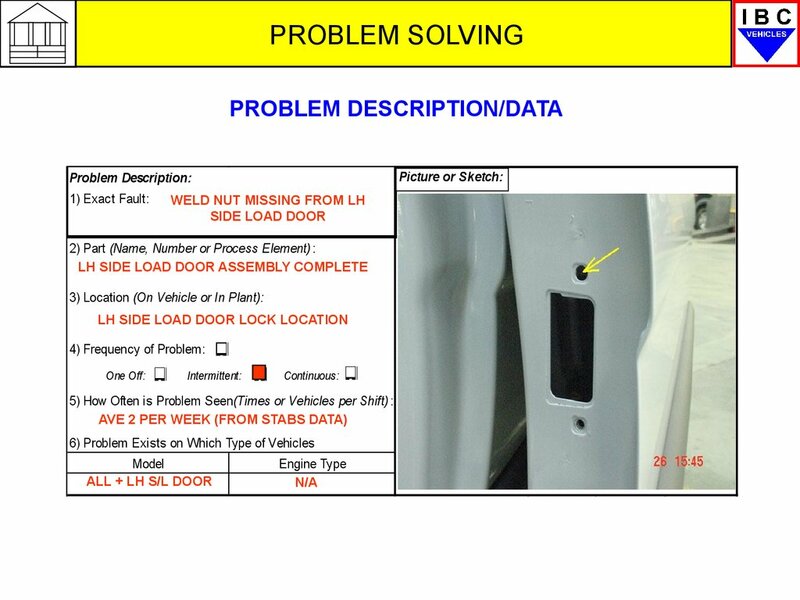 12 Have the Poke-Yoke devices been verified - Maint records? 14 Does the workstation allow the operator to work effectively? 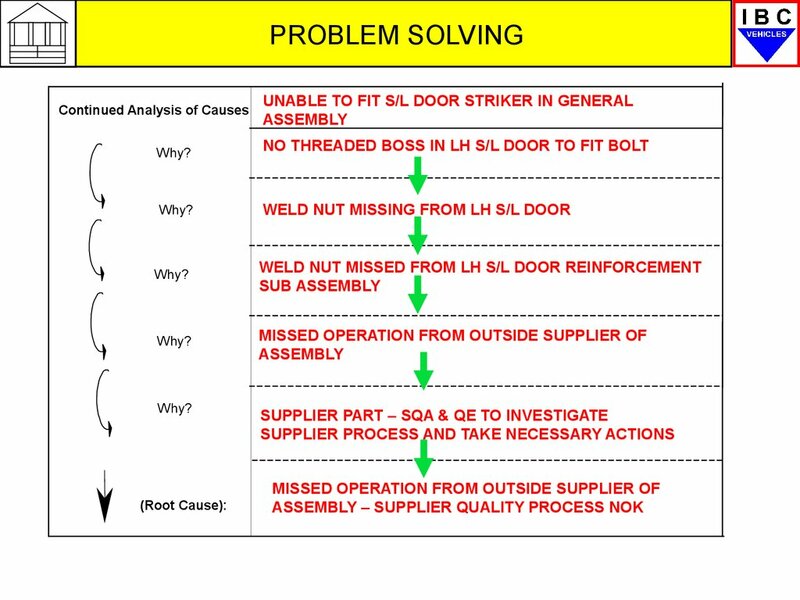 Are the specified parts being used (check variants)? Are the correct part numbers identified on the material rack? Are the correct parts in the correct location on the rack? Do the part numbers on the boxes agree with the rack? Has a PAA/EWO been issued changing part (check with ME)? Is the PAA still valid? Is part selection error proofing needed? Is existing error proofing device working correctly? Is there any evidence of damage to the parts prior to assembly? Can defect be recreated on re-assembly? Does defect follow the vehicle / body? Does defect follow the part? 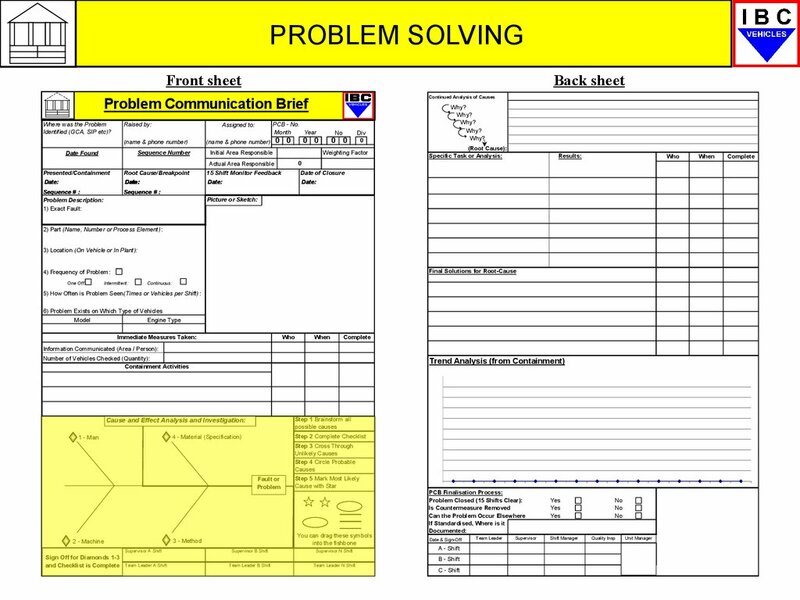 Is the part out of specification? 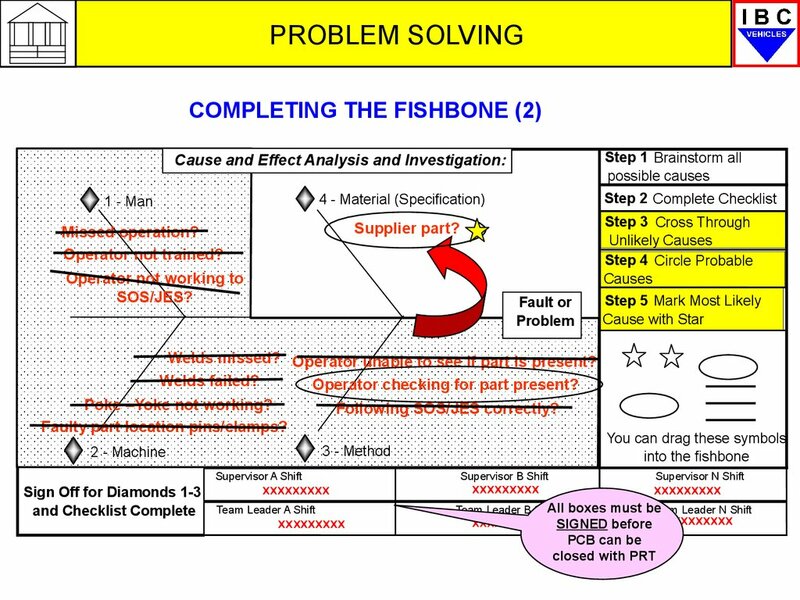 If not in specification, has a PAA been written? Are countermeasures / containment in place? Has a PRR been issued and supplier contacted? 1 Are the guns/tools/equipment identified on the JES being used? 8 Are the guns/tools/fixtures protected where required? 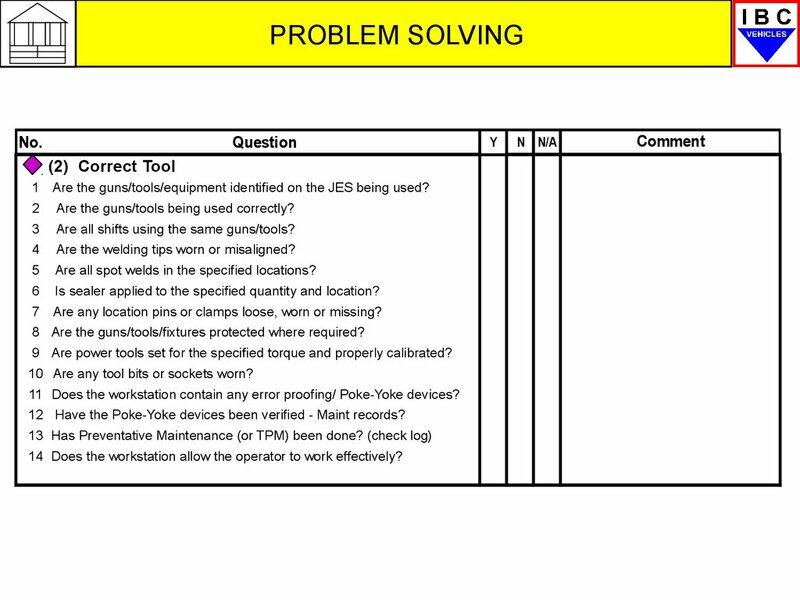 9 Are power tools set for the specified torque and properly calibrated? 10 Are any tool bits or sockets worn? 1 Are the specified parts being used (check variants)? 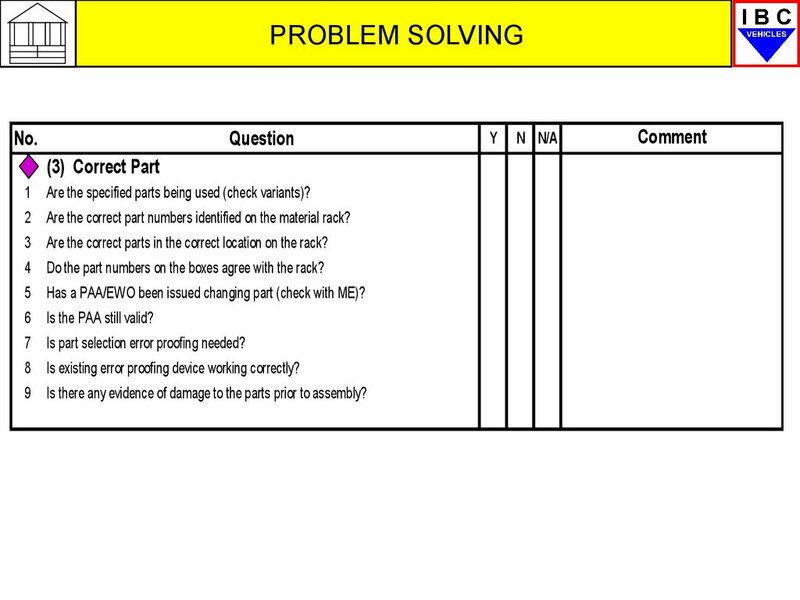 2 Are the correct part numbers identified on the material rack? 3 Are the correct parts in the correct location on the rack? 4 Do the part numbers on the boxes agree with the rack? 5 Has a PAA/EWO been issued changing part (check with ME)? 6 Is the PAA still valid? 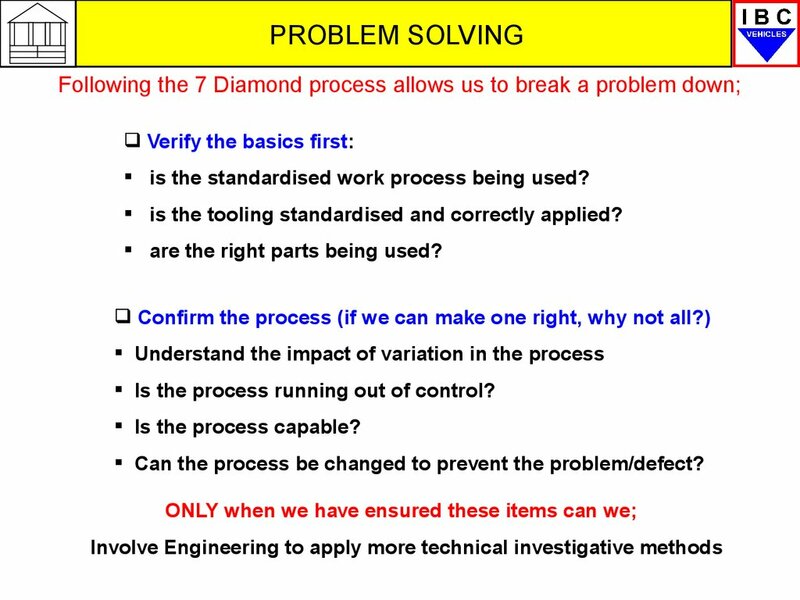 7 Is part selection error proofing needed? 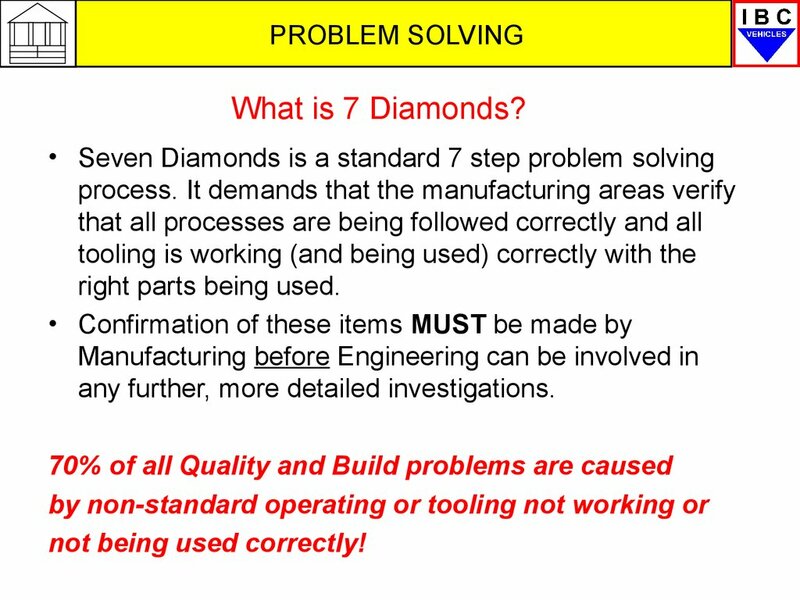 8 Is existing error proofing device working correctly? 9 Is there any evidence of damage to the parts prior to assembly? 1Can defect be recreated on re-assembly? 2 Does defect follow the vehicle / body? 3 Does defect follow the part? 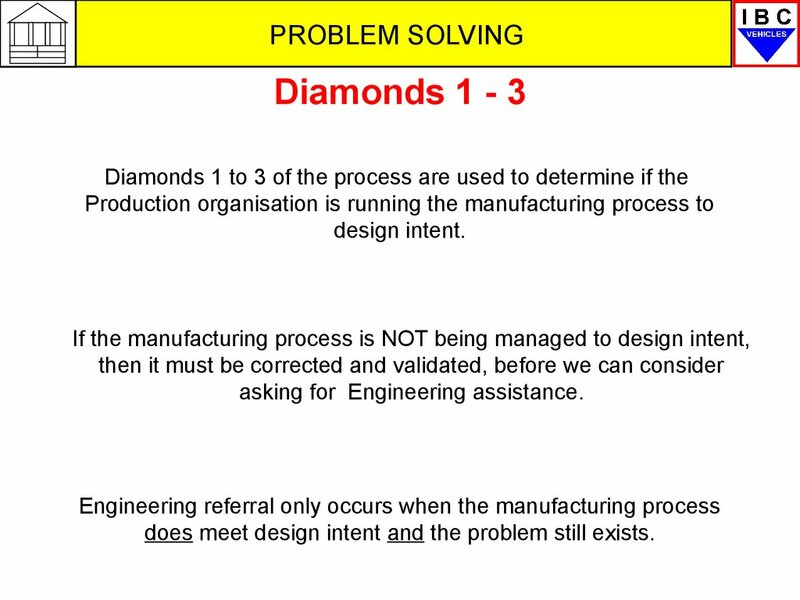 1 Is the part out of specification? 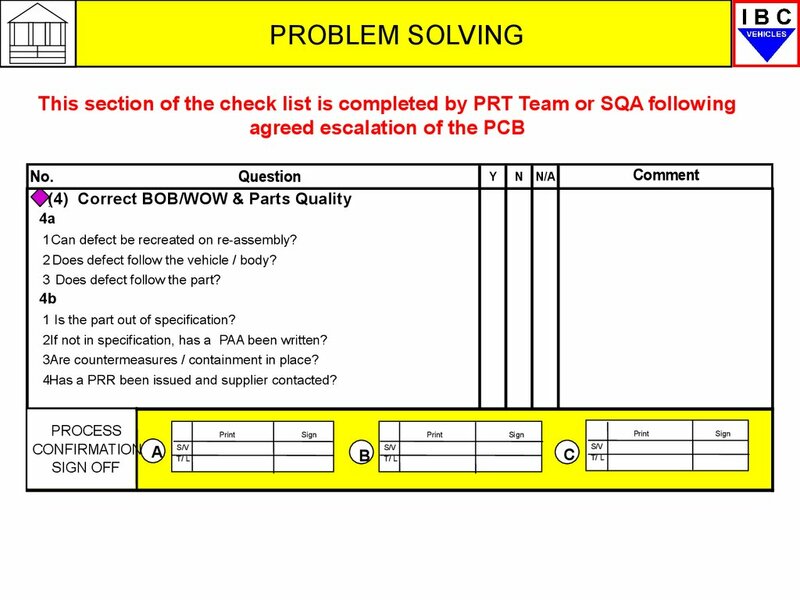 2If not in specification, has a PAA been written? 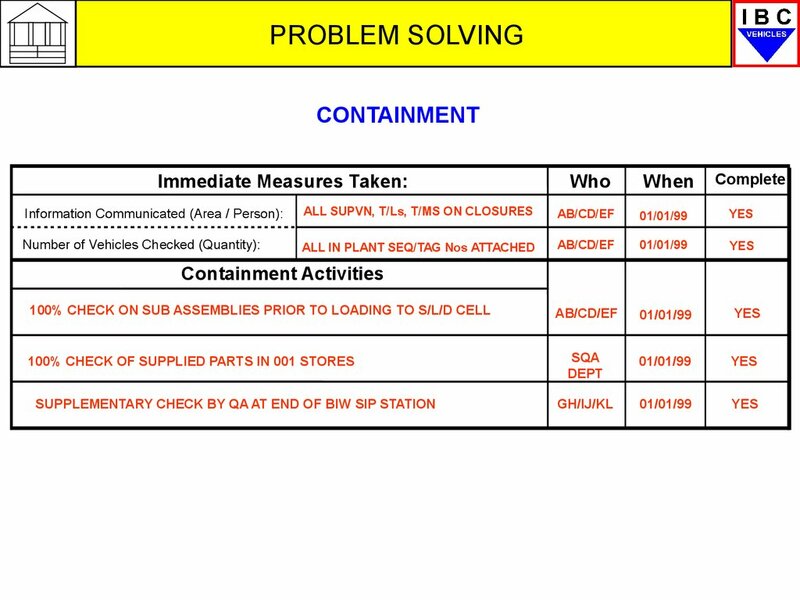 3Are countermeasures / containment in place? 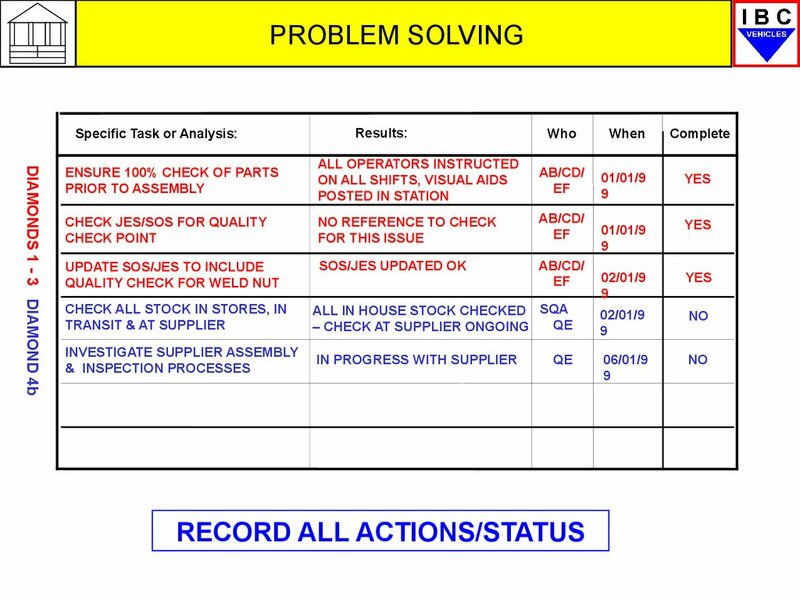 4Has a PRR been issued and supplier contacted? This part of the PCB MUST be filled in by hand. 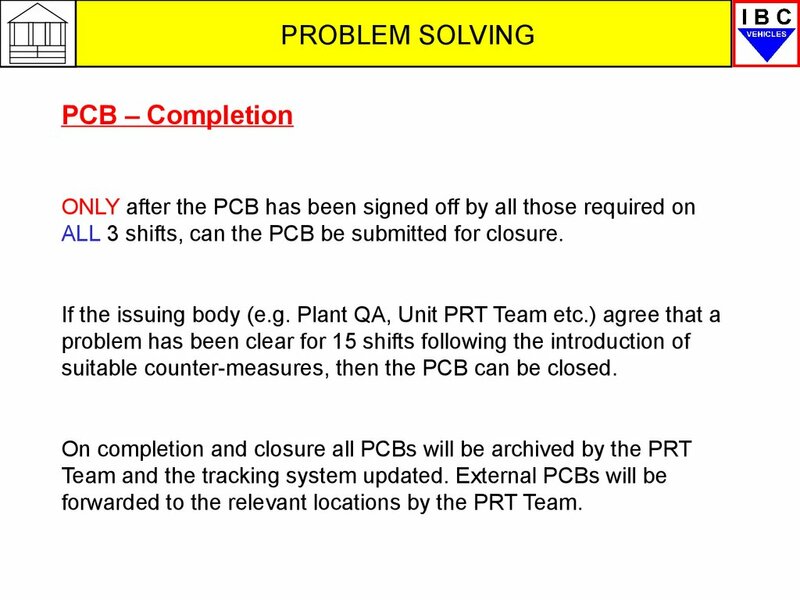 ALL 3 shifts, can the PCB be submitted for closure. suitable counter-measures, then the PCB can be closed. 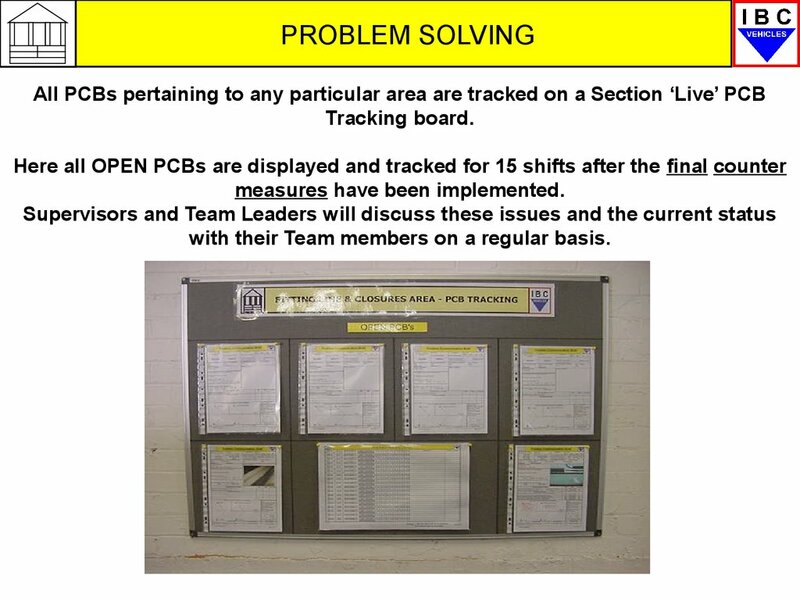 forwarded to the relevant locations by the PRT Team.